D. dorsata is widespread in the southern half of England, becoming scattered in the west and north as far as Yorkshire. It is widespread in western and central Europe, but commoner towards the south of the region (Roberts 1995). It has not been recorded from Ireland. This species is strongly associated with woodland, perhaps with a preference for evergreens and conifers, and is found on the leaves of bushes and trees such as oak, box, yew and conifers, and is therefore usually collected by beating. It can also be found in leaf litter, and occasionally in the field layer of undisturbed scrubby grassland (Crocker & Daws 1996), and on fence posts in 'ballooning' weather. 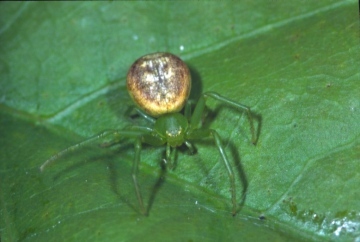 Females can be found guarding the eggs, which are covered with a thick layer of silk in a partially bent leaf. The characteristic colouring allows adults and juveniles to be identified in the field. Adults of both sexes are found mainly in May and June, females persisting occasionally into the autumn. Diaea dorsata female on ivy.